Are you a Springfield native, or a Springfield transplant? I'd consider myself a Springfield native. My roots are in Lebanon, Missouri. However, I grew up spending a lot of my time in Springfield. I love the idea of branding. Crafting how you want others to view your company or self is a very unique and interesting field of work. I love being in the know of what’s going on in Springfield, plus, the office environment at Revel is always fun. Do you have any office nicknames around the office? I’d say most of my friends describe me as outgoing and goal-orientated. I could probably talk to a wall so I’m sure they would bring that up as well. I love people, adventure and having a good time. I’m also real goofy sometimes, so I guess it just depends on my mood. Well, I love to travel which in hindsight may not be that unique, however, I have been to 5 out of the 7 continents before I was 21 (which I think is pretty neat.) My main goal is see all 7 before I turn 25. I also really love to run, I have ran in 5 different 5K’s and a half marathon, and I’m currently training for another half marathon coming up in November here in Springfield! I have two separate running goals; to run a marathon and to run a 5K in every state. French fries in any shape or flavor. Those things are heavenly. I would learn either how to code a website or speak fluent Spanish. I’m not sure I would qualify this as my favorite book of all time, but the book I’ve just recently read that I’ve applied to my life is, Settle for More by Megyn Kelly. She’s quite frankly a badass. I can pop my nose, and not in the make-believe way where you pretend you’re popping it, when in reality you’re actually thumbing your front teeth to make the noise. I found this out when someone was trying to trick via the “prank way” in middle school. So, I tried it and actually popped my nose. I’m pretty sure he is forever freaked out, but I learned I have a superpower, so I’d say it was a pretty successful day. Wow, this is a lot of pressure. Part of me wants to think it would be a hilarious, sarcastic song when in all honestly it would be something like “I lived” by One Republic. If you could meet anyone - living or dead - who would you choose? I’d love to have dinner with Kelly Ripa. She does it all. She really has a certain charisma about her that I admire. I’d just love to talk with her about how she designed her life. A black lab. Trendy, friendly and always in style. Do you have a creative question for Savannah that wasn’t covered in our interview? Post it in the comments section below, or send a tweet @revelads and we’ll hit you back with an answer! Don’t forget to check out the other Revelers in our Get to Know a Reveler blog series! This year at Revel we chose to be crafty when it came to making our Holiday cards. Each of us were tasked with creating our own individual letter. We all started with pencils, edited in Illustrator and then produced some good old fashioned letterpress blocks. The delicate N was created by Nicole. The O was crafted by Chris (kudos for those who spot the sports reference). The E was meticulously fine-tuned by Amanda, while the L was made by Adam. We then enjoyed pressing each individual card via the letterpress studio at Missouri State University. We hope you enjoy the hard work we put into each and every card. 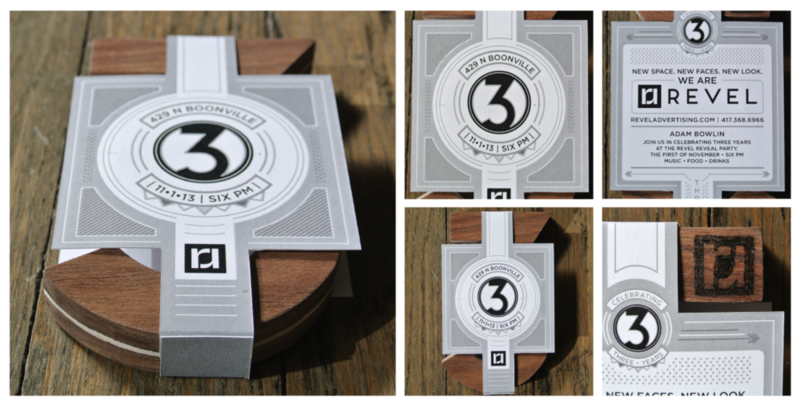 Revel turned three recently, so we made some invitations. We decided to commemorate the event with some handcrafted numbers to give to a few of our clients. 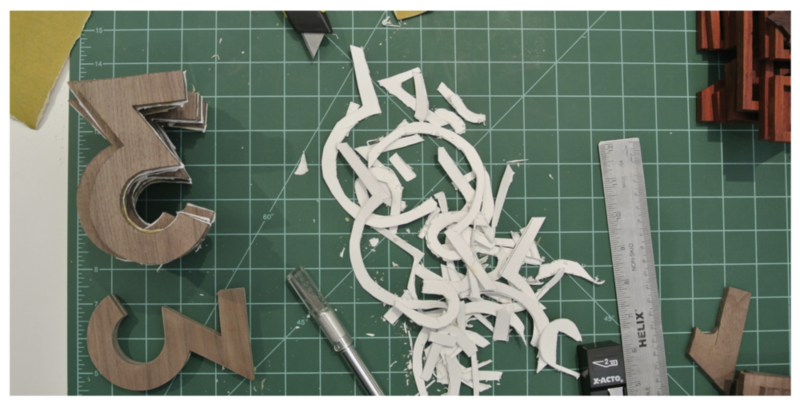 We filled the studio with sawdust and paper scraps but the end result was worth the mess. You can see the process above and the finished product below. 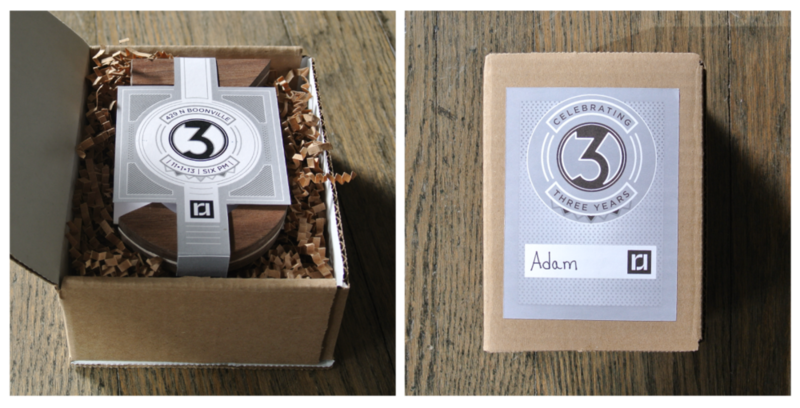 Every piece was handmade, from the paper wrap to the wooden 3. We used ¼" walnut planks for the number with 220 lb. cotton paper inlayed between. 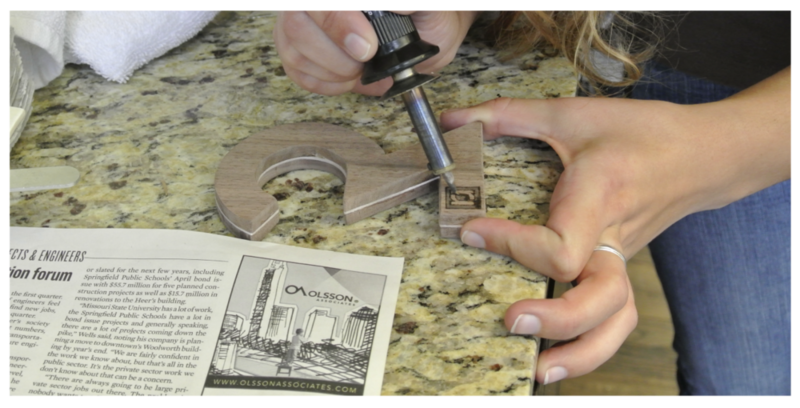 We then branded each piece by hand with a crafty wood burner. Every Revel team member played a part in the process, stain still remains on some of our hands.